Integrated solutions that connect the front and middle office. With sophisticated next generation portfolio analytics paired with our award-winning B-One performance and attribution solution, FactSet brings you greater accuracy of performance calculations and reporting with higher frequency and faster delivery, while helping you maintain compliance with new and emerging regulations. Evaluate relative and absolute performance. Understand how management decisions such as security selection, group allocation, and currency tilts affected performance results. Evaluate relative performance in real time using several different attribution models, including equity, fixed income, balanced, risk, top down, and macro-level. Identify the securities and groups that contributed to or detracted from portfolio performance on an absolute or relative basis. Attributing returns for balanced portfolios presents unique challenges. Understand the most common problems and how to solve for them in this white paper. Analyze the specific exposures that helped or hurt performance by evaluating relative performance using several sophisticated attribution models for equity, fixed income, and multi-asset class portfolios or macro attribution models for fund of fund or asset allocation strategies. Leverage two- or three-factor attribution to determine the allocation, selection, and interaction effects within your portfolio. Better understand the tracking error of passive portfolios using FactSet’s passive attribution model. Build financial models and power customized applications outside of the workstation with our developer portal. Integrate data across the front and middle office. 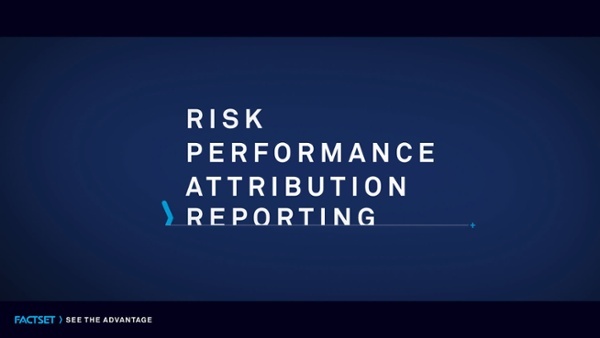 Performance, attribution, and risk calculations rely on the quality of data and its aggregation. With the same data and analytics at the heart of each, you can optimize your data integration from performance measurement and client reporting to supporting your compliance and risk workflows. With decades of experience integrating databases and hundreds of engineers and quality assurance professionals dedicated to ensuring timeliness and integrity, FactSet combines high quality data available in the marketplace with best-in-class performance and risk analytics, robust reporting, and seamless delivery of these analytics both inside and outside the firm. Build financial models and power customized applications outside of the workstation with our developer portal and APIs. Find and highlight your unique value. Analyze your portfolios’ returns against 20,000 equity and fixed income benchmarks, with more than 70 Modern Portfolio Theory risk statistics such as beta, standard deviation, r-squared, alpha, and tracking error. FactSet helps you determine the peer rankings of your portfolios against thousands of benchmarks, competitor funds, and peer groups. Distributing performance information to all the people who want to see it can be as much of a challenge for performance teams as calculating performance metrics. What’s worse, most of the reports you create may not even be read. Retain control of the performance message while giving front office personnel, marketing and sales specialists, and your executive team the ability to access, interact, and analyze both pre-calculated indicative and official results simultaneously. Our flexible information delivery systems can support any type of market and portfolio data in multiple formats and languages, with robust performance and attribution results, native Microsoft Excel integration, API support, and flexible browser portals that deliver results to internal and external clients. Help maintain compliance with GIPS provisions. With regulation complexity on the rise, performance teams can’t afford to rely on manual reconciliation to produce data. FactSet’s management tools and easy-to-use disclosures functionality helps you ensure compliance with CFA standards and certification. With multi-firm and multi-currency capabilities, you can integrate GIPS composites management within your FactSet performance system or use it separately. Both options give you rules-based or manual composite membership, flexible gross/net of fee functionality, and automatic controls and checks at the firm, composite, and portfolio level.